The Wireless-N Universal WiFi Range Extender is designed to conveniently extend the coverage and improve the signal strength of an existing wireless network and eliminate dead zones. Small size with better performance and wider coverage! Works with any standard router or gateway. Say goodbye to WiFi dead zones! The Wireless-N WiFi Range Extender boosts your existing Wi-Fi coverage, extend wireless network to hard-to-reach areas. Also works as a media bridge. While boosting your existing Wi-Fi coverage, the two Ethernet ports can also connect any wired device such as a smart TV, multimedia player, game console or PC to your WiFi network. Easily expand wireless coverage at a push of the Wireless-N 's WPS button and your router's WPS button. Or, browser-based configuration, accessible from almost any device, including iOS and Android mobile platforms (if your router do not have a WPS button). In Access Point (AP) mode, it can be connected to any wired LAN to create a new Wi-Fi Access point, allowing the internet connection to be accessed from laptops, tablets, phones or other Wi-Fi devices. 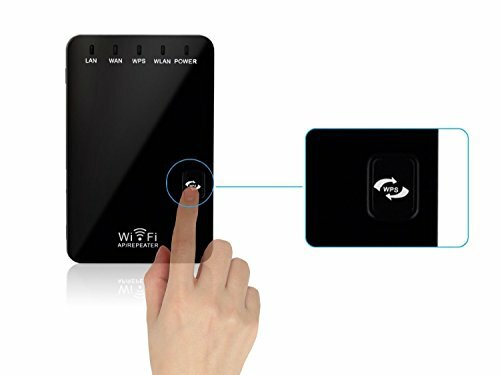 5-in-1 Router,Wireless Router, Repeater, AP, Client and Bridge, The Wireless-N range extender brings Wi-Fi as the way you need it with its three selectable Work Modes. 3.Easy Installation: Easily expand wireless coverage at a push of the WPS button; or browser-based configuration, accessible from almost any device. If you have any questions about this product by XDCDHM, contact us by completing and submitting the form below. If you are looking for a specif part number, please include it with your message.